To listeners outside his native Sweden, Dag Wirén might seem to be a "one hit wonder", the hit being the Serenade for Strings - from which the March is particularly famous. Of course, he wrote much else besides and, on this evidence, in a similar vein. Although recognisably Nordic, his music reminds me of George Lloyd; no boundaries pushed back but good, tuneful listening. The disc takes its title from the fourth movement (of five) of the Romantic Suite. This work is based on music that Wirén wrote for a production in Stockholm of �The Merchant of Venice� in 1944. Gyckeldans is the Jester�s Dance, a fantastic romp that is probably the most striking piece on the disc. It is sandwiched between two lovely movements � �Serenade for Jessica� (Shylock�s daughter) and �Portia�s Castle�. This suite surely deserves to be better known. The Flute Concertino is in a traditional three movement format. A relatively late work, it has some darker overtones, perhaps reflecting a man who became more serious in later life. There is some beautiful flute playing from soloist Jan Bengtson to be heard here. This is followed by the first recording of Plats på scenen (which translates as �Take your places on the stage�), a ballet which Wirén wrote for the dancer and choreographer Julius Mengarelli. When Mengarelli died unexpectedly just before the première the production was abandoned and the music lay unperformed for over forty years until this recording was made. The ballet is a humorous tale about what can happen behind the scenes when staging a ballet. The music which is cast in nine short sections is certainly worthwhile and I wonder if it will eventually be staged? I enjoyed hearing more of Wirén and was disappointed that the disc did not contain something else, given that he was fairly prolific and there are almost 33 minutes of empty space. 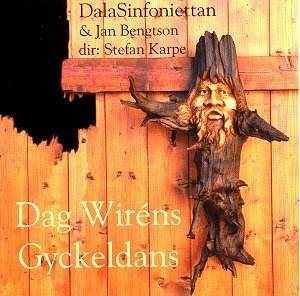 That is my only significant gripe, for the playing of the DalaSinfoniettan and the recording are most impressive. This orchestra is based in Falun, a fairly small place about 150 miles North-West of Stockholm. They describe themselves as "a flexible orchestra in size, time and place". I suppose all orchestras have to be nowadays but perhaps more so if you are based in rural Sweden. They were formed in 1988 have twenty regular musicians, complemented with freelancers and they also join forces with neighbouring orchestras. Their conductor, Stefan Karpe, appears youthful too and is a name for watch out for. I�d certainly be happy to hear more of such committed, idiomatic playing. The track titles are given only in Swedish but everything else is translated, and the notes are informative. This well-presented disc seems to be aimed mainly at the Swedish home market but it deserves a wider audience.